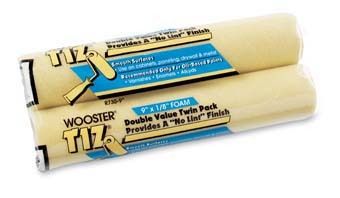 DiscountPaint.net :: PAINTING SUPPLIES :: WOOSTER R730 TIZ TWIN PACK SIZE:9: PACK:30 PCS. Yellow foam for a lintless finish. Strong paper core. Recommended only for oil-based paints, varnishes, or enamels. Use on smooth surfaces such as cabinets, doors, paneling,drywall, and metal. Double value, packed two per bag. WOOSTER 4731 ADVANTAGE ANGULAR SASH BRUSH SIZE:2" PACK:6 PCS. WOOSTER J4102 SUPER PRO BADGER FLAT SASH PAINT BRUSH SIZE:2.5" PACK:6 PCS. KRYLON K357 SPRAY WEEKEND GLOSS WHITE SIZE:11 OZ. SPRAY PACK:6 PCS.